Tremor will stay on the ground and do a frontal AOE cone of sand breath. After sand breath, Tremor will submerge and about a dozen lobstroks will spawn. Two of them are larger, Tangled Lobstrok, and you can clearly see they are in a net. Once the larger ones are dead they will shed their net, making it clickable. You will need to use the net to prevent Tremor from submerging. Although The lobstroks that spawn have about 65k hp and are fairly easy to kill, they are nasty since they do a cone aoe that will kill you within seconds. Once you click on the net, a button will appear on your UI. Keep using the net on Tremor, it will stay on him for about 45 seconds. You will have a debuff telling you how long until your net disappears. Recast the net on Tremor before it expires to gain the maximum benefit. I was able to complete this solo as an enhancement shaman. I saved my wolves and fire elemental totem for the first wave of adds. Once I picked up the net, I was able to get enough use from it to get Tremor to 600k hp where he submerged again. By that time my wolves were up again and I was able to pick the net up again. Pretty easily soloed as a 680 Demonology warlock. He has 2.5M hitpoints but hits like a wet noodle. 1) the key is to avoid wide-spreaded aoe (you will notice that). just run through that elite. also soloed by rogue 650 with siege machine from gnomish gearworks. To be honest - there was nothing to be worried about. i believe any class in such vehicle can manage that elite. Managed it very easily as a Fury Warrior 636. Dodged the AOE attack, bladestormed the adds and picked up the nets, kept Tremor netted as long as I could. In the end it's just about being patient because he has a lot of exp, but it's not difficult. Below is a list of the garrison Bounty quests. These are obtained from visitors to your garrison - each day you have a 1 in 5 chance of getting a Bounty quest NPC. Other possibilities for visitors include Harrison Jones, a trade vendor, a dungeon quest NPC, or a raid quest NPC. 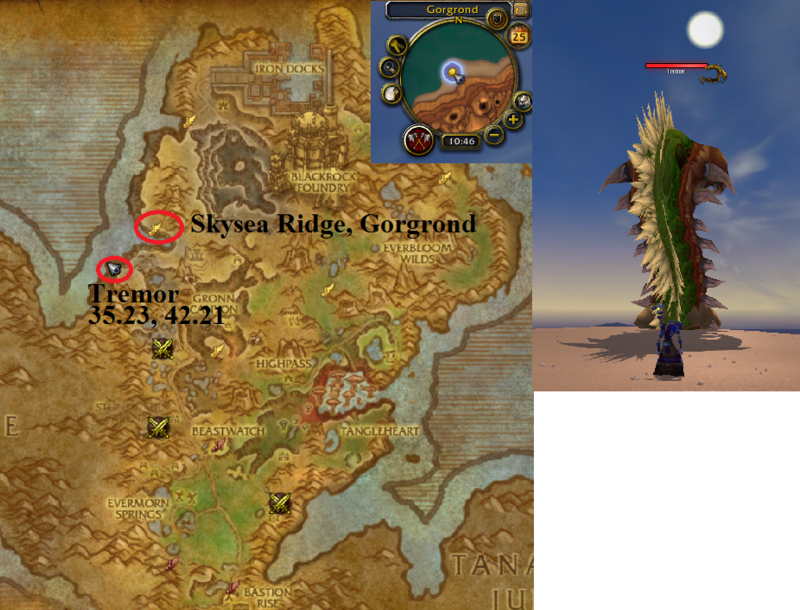 The bounty quest NPC is Shadow Hunter Ty'jin (Horde) or Renzik "The Shiv" (Alliance). Death to Nullifier Darkoor! Death to Nullifier Darkoor! Bloody Stack of Invitations has a chance to drop from the mini-bosses that are the target of the daily Bounty quest. This includes Tremor, Undertow, etc. as per the chart above. When it drops, only a single Bloody Stack of Invitations drops per group (rather than for every group member). However, the 3 Ring of Blood Invitation inside can be distributed by the person receiving the stack. Each of the Bloody Stack of Invitations contains 3 Ring of Blood Invitation. The Ring of Blood Invitations are BoE and can be sold or traded on the Auction House. The Ring of Blood Invitation initiates a quest (The World Famous Ring of Blood!) that involves killing 5 opponents in the Ring of Blood, and rewards Mogor's Cache, containing gold, Apexis Crystals, and follower upgrade tokens/follower armor sets.